your busy life with comfort and confidence. Paula often wondered how she could possibly manage the schedules and needs of 4 kids, while working part-time and taking care of her home. When she was diagnosed with stress urinary incontinence her feelings of being overwhelmed only got worse. She wondered how she could even leave her house when she was always worried about leakage and accidents. 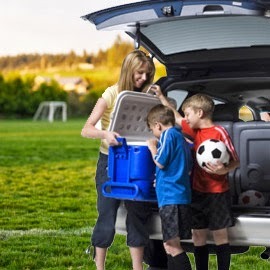 However, she didn’t want to miss any of her kids soccer games, dance recitals or other weekend activities. It was only when she did some research that she found the right incontinence product to meet her needs and allow her to take on the weekend(and every other day) with comfort and confidence! After doing some research and sampling a few different types of incontinence supplies, Paula found Depend Silhouettes were the right choice for her because of their feminine shape and discreetness. She could use this incontinence product for women and still maintain her busy schedule without having to slow down to manage her stress urinary incontinence. There are many different reasons Depend underwear for women could be right for you or someone in your care, here are 3 of them. 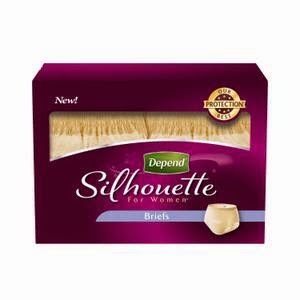 Depend Silhouettes for women look and feel like normal underwear. When many people think of incontinence they assume this is problem which only affects the elderly, bedridden or those who are seriously ill. You may be surprised to learn many active people have to deal with and manage urinary incontinence and they want to do it in a way which fits in with their busy lives. Depend Silhouettes for women offer an incontinence product for women which looks and feels feminine and can be worn discreetly and comfortably under normal clothes. And new Silhouettes will be offered in a combo pack of beige and black. or someone in your care. Depend Silhouettes offer the highest level of absorbency for “peace of mind” protection. The most stressful aspect of managing urinary incontinence is the worry and fear that leakage or an accident will occur when someone is outside of their home. The possible embarrassment often leaves many people afraid to leave home. The makers of Depend understand this. They make Depend Silhouettes to provide the highest level of absorbency so women can wear them knowing they are secure against leakage no matter what they are doing. Depend Silhouettes offer a range of sizes for the best protection possible. One of the major factors as to whether an incontinence product for women works well is size. Not to long ago, users of incontinence supplies had to be satisfied with a “one size fits all” approach. Today, the makers of Depend understand fit is an important part of protection. They offer Depend Silhouettes in a range of sizes so no matter how small or large you are, you can choose the right fit and receive the highest level of protection. Stress Urinary Incontinence vs. Overactive Bladder. What's the Difference? Poise Impressa. A Game Changer.